It looks like a 'Game Mode' is coming to Windows 10 in an update in the not-too-distant future. Evidence pointing to this dedicated Windows gaming mode comes from a Twitter user called Walking Cat, who has pawed over the 14997 build of Windows 10 on the prowl for interesting changes. The Walking Cat (AKA @h0x0d) discovered a new OS library file called 'gamemode.dll'. It's interesting to see what users like Walking Cat have uncovered so far in their poking and prodding of Windows 10 Insider Preview 14997. The latest iteration of the OS looks to be leaner than ever, taking up a significantly smaller portion of disk space, especially with compression on. Furthermore, there are various new apps and support for features such as spatial audio and more. Perhaps the most interesting new thing though, to those that like to use their PCs for gaming on the odd occasion, are the signs of a new 'Game Mode' on the way. As highlighted by the Walking Cat Twitter post, Windows 10 14997 has a new DLL called 'gamemode.dll'. It is noted that such a feature was a popular request in the Microsoft Feedback Hub. So now it looks like Microsoft has been working in the background to implement it. What the Windows 10 game mode will do is open to speculation. 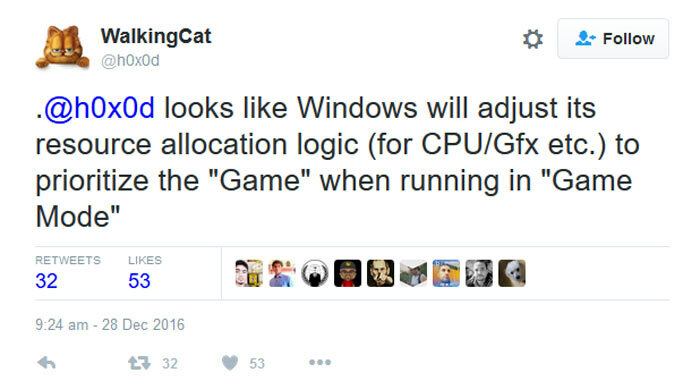 However, the story source reckons "Windows will adjust its resource allocation logic (for CPU/Gfx etc.) to prioritize the 'Game' when running in 'Game Mode'." Such a mode could help your PC cope better in games that are pushing its hardware resources to the limit. I would hope that the mode would be configurable via a control panel or similar. Microsoft hasn't come forward to confirm any upcoming 'game mode' but it could be another new feature that arrives with the major Windows 10 Creators Update scheduled for early 2017. What's the betting it will be locked to UWP games from the Windows store and run via the XBox app. I hope this is genuine and implemented well. I'm currently running an A10 7870K (which for the cost of the build, I could not be happier with) with an old laptop HDD inside a cardboard box for a case. I sure wouldn't mind a few fps when playing KSP or Stellaris lol. Whilst I'm inclined to say “probably” (so that the OS can communicate with the UWP and I suppose ditch stuff that can be ditched), non-UWP apps are already supported via the Xbox app complete with their own game hubs such as League of Legends. for comedy value we opened up solitaire - yes that crappy piece of MS free junk - on our brand new win10 lappy over the holiday. i) it is a ghastly pile of junk compared even to the XP version, nevermind win7, 2) it tries to connect to internet and MS app store X-box blah blah blah - only way to stop this is using flight mode, and 3) watch your battery get gobbled up either way. If this is triggering a “game mode” for something as basic as solitaire they need to sort it out, as there is no reason why something so basic should nuke 5 hours of battery life in about 1 hour, with the fans maxing out etc etc. Yay… why not, complain about something that's FREE!